of Pharmacognosy, T. (2014). In memory of Dr. Farzaneh Naghibi (1965-2014). Research Journal of Pharmacognosy, 1(2), 1-2. The Iranian Society of Pharmacognosy. "In memory of Dr. Farzaneh Naghibi (1965-2014)". 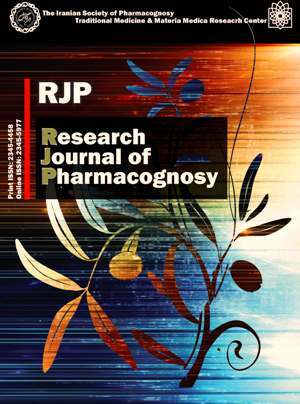 Research Journal of Pharmacognosy, 1, 2, 2014, 1-2.
of Pharmacognosy, T. (2014). 'In memory of Dr. Farzaneh Naghibi (1965-2014)', Research Journal of Pharmacognosy, 1(2), pp. 1-2.
of Pharmacognosy, T. In memory of Dr. Farzaneh Naghibi (1965-2014). Research Journal of Pharmacognosy, 2014; 1(2): 1-2. On 17th January 2014, one of the influential and outstanding pharmacognosists of Iran passed away at the age of 48. Dr. Farzaneh Naghibi will be remembered for her contribution in ethnobotany, ethnopharmacology, herbal medicine and Iranian traditional pharmacy. She worked as an associate professor and head of the Department of Traditional Pharmacy, School of Iranian Traditional Medicine, Shahid Beheshti University of Medical Sciences, Tehran. She had contributed in around 90 high quality full papers and abstracts in international and local journals and 3 books in natural products sciences. Some of her papers were cited more than hundred times. Dr. Naghibi obtained her doctorate in pharmacy (1989) and PhD in pharmacognosy (1997) from Tehran University of Medical Sciences. She was one of the active members of the Iranian Society of Pharmacognosy, Iranian Association of Pharmaceutical Scientists, Iranian Association of Pharmacists, Iranian Biotechnology Society and International Committee of Medicinal Plants. Along with her scientific studies, Dr. Naghibi was active in educational and professional works. She collaborated with some of the Iranian pharmaceutical companies like Soha and Tolid Daru. Dr. Naghibi was the founder of Traditional Medicine and Materia Medica Research Centre, Shahid Beheshti University of Medical Sciences. She played an important role in the development of the field of traditional pharmacy during her life in this center. She was also one of the founders of the School of Traditional Medicine at Shahid Beheshti University of Medical Sciences. Since the establishment of the school, she had been the head of the department of Traditional Pharmacy. She attended many international and local conferences and meetings on medicinal plants and had close collaboration with some of the famous scientists of these fields. Dr. Naghibi organized several series of “International Congress on Traditional Medicine and Materia Medica” in Iran and abroad. She was elected as distinguished scientist of one of these congresses in 2006 that was held in Kuala Lumpur, Malaysia and as a distinguished academic member of Shahid Beheshti University of Medical Sciences in 2011. Due to her efforts and activities, the biological laboratories of the Traditional Medicine and Materia Medica Research center was named after her by the head of Shahid Beheshti University of Medical Sciences in Feb 2009. Despite the above achievements, her great proud was teaching to the most creative, diligent studious students who were fond of their country. Dr. Naghibi never stopped working although she was not in good health conditions in the last six years. Her health condition became worse in the last two years and she spent much time at home or hospitals, however even during that time she continued her scientific working. She not only inspired her colleagues and students in her laboratories, but also taught them that everything was possible for improving of knowledge and research. Her postgraduate students have joined the departments of pharmacognosy at Iranian schools of pharmacy in various parts of the country. After more than twenty years of fruitful and hard work, she passed away in Tehran due to the cancer, albeit, she is remembered by her great and valuable works on medicinal plants. She dedicated her life to research and education. She can be considered as a hardworking role model for the young generations of pharmacognosists and pharmacists. The Iranian Society of Pharmacognosy was overfilled with sadness by the tragic loss of the late Dr. Naghibi. She will be in our hearts and prayers and may she find eternal life. Her memory will always be alive for all of us and we miss her most of all.